The field of percutaneous valve replacement and repair is currently developing at a rapid pace: percutaneous treatment of valvular heart disease is now one of the fastest developing areas of cardiology. Transcatheter aortic and pulmonary valve replacement and a variety of mitral valve therapy approaches have been successfully performed in hundreds of patients (see the table below). A number of problems related to operator technique or specific devices have been encountered and solved. *Approved for clinical use or in clinical trials. Efforts to develop and refine percutaneous catheter-based approaches to cardiac valve repair and replacement have advanced rapidly over the past several years. Such clinical strategies were initiated as early as the 1950s with the introduction of simple catheter devices for treating pulmonic stenosis. Treatment of stenotic lesions matured in the early 1980s with the advent of balloon valvuloplasty, which has become the predominant therapy for primary pulmonic and mitral stenosis lesions. Percutaneous aortic balloon valvuloplasty, however, has yielded largely unfavorable results and is now seldom performed because of its substantial risks and short-lived benefits. New innovations have been directed toward the 2 most frequent forms of valvular heart disease in the industrialized West: aortic stenosis and mitral regurgitation, which account for more than 70% of the cases of acquired valve disease in the United States and Europe (see the table below). The incidence of valvular heart disease is expected to increase over the next several decades as the "baby boomer" generation passes into advanced decades of life. Treatment of heart disease—primarily valvular heart disease (as medical treatments for atherosclerosis improve)— is expected to represent one of the main arenas for maintaining good health in this aging population. With the increasing availability of cardiopulmonary bypass, surgical expertise, and intensive care facilities, valve repair and replacement are widely performed to relieve symptoms and improve prognosis of valvular heart disease, despite the associated morbidity and mortality. However, many patients with major comorbidities, particularly elderly patients, still do not undergo potentially beneficial interventions, because of the high surgical risk. Investigations into the current management of patients with valvular heart disease in Europe and the United States showed that as many as one third of elderly patients with severe symptomatic aortic stenosis, and a similar number of patients with mitral regurgitation, were not referred for surgical management by the attending practitioner. The percentage of nonreferrals from the cardiologist’s office is likely to be even higher, and that from the general practitioner’s office may be higher still. A catheter-based alternative to surgery could significantly reduce morbidity and mortality, thus making treatment available to patients not currently considered surgical candidates. In addition, a less invasive therapy might permit treatment of valvular heart disease at an earlier stage and thereby prevent the onset of progressive ventricular dysfunction. Moreover, patients show a strong preference for minimally invasive therapies in general, especially those patients who have undergone many operations. Finally, successful use of percutaneous approaches to valve replacement and repair could have a substantial positive economic impact by virtue of the associated reductions in intensive care unit (ICU) and hospital stays. Realization of the potential benefits of these innovations may result in a paradigm shift, challenging long-standing traditional principles in the evaluation and treatment of valvular heart disease. Both short-term and long-term data are probably needed to assess percutaneous approaches against conventional surgical approaches with respect to superiority in safety and noninferiority in efficacy. The excellent results of contemporary surgical approaches to valvular heart disease have set a high standard for any new treatment strategies being considered. However, patients who are considered candidates for less invasive procedures may present a different risk profile than patients who are currently referred for surgery (at both the high end and the low end of the risk spectrum); therefore, comparisons with current outcome standards may not be appropriate. Thus, it is essential to keep in mind that patients referred for valvular interventions today tend to be elderly and to have increased surgical risk associated with congestive heart failure, the emergency nature of the operation, left ventricular dysfunction, coronary disease, previous operations, and (most important) severe comorbidities. Measures of invasiveness and effectiveness will also have to be weighed against the realities of patient expectations in potential patient candidate pools (those who currently may or may not be referred for surgery). In the context of the outstanding track record achieved for surgical aortic valve replacement, for example, large trials with extremely large sample sizes will be required to prove equivalent hemodynamic and clinical results with the new nonsurgical devices in good (low-risk) surgical candidates. Such trials will require close collaboration between interventional cardiologists, echocardiographers, engineers, and surgeons. Although significant challenges in patient selection and clinical trial design remain to be solved, the patient populations who may ultimately benefit most from treatment with these new technologies should become better defined over the course of the clinical trial process. These creative new transcatheter approaches may change the face of valve therapy and extend treatment to a larger proportion of the valve disease population. Hybrid procedures combining percutaneous techniques with minimally invasive surgery may also become more popular. For the near term, percutaneous techniques in central mitral regurgitation and percutaneous aortic valve replacement in particular remain investigational and should be restricted to patients considered to be at high risk or patients who are not candidates for conventional surgical treatment. The normal human heart contains 4 valves that regulate blood flow into and out of the heart. The aortic and pulmonic valves are known as the semilunar valves, whereas the tricuspid and mitral valves are referred to as the atrioventricular valves. 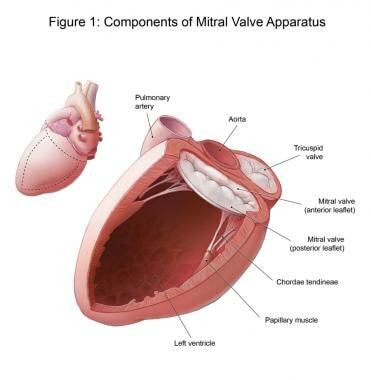 All the valves are trileaflet, with the exception of the mitral valve, which has 2 leaflets. All 4 cardiac valves are surrounded by fibrous tissue forming partial or complete valvular rings, or annuli. These annuli join the fibrous skeleton of the heart to anchor and support the valvular structures. The aortic valve is located between the left ventricular outflow tract and the ascending aorta. It forms the centerpiece of the heart and closely approximates many other important cardiac structures; specifically, the pulmonic valve anteriorly, mitral valve posterolaterally, and tricuspid valve posteromedially. The mitral valve connects the left atrium and the left ventricle. The mitral valve opens during diastole to allow the blood flow from the left atrium to the left ventricle. During ventricular systole, the mitral valve closes and prevents backflow to the left atrium. The normal function of the mitral valve depends on its 6 components, which are (1) the left atrial wall, (2) the annulus, (3) the leaflets, (4) the chordae tendineae, (5) the papillary muscles, and (6) the left ventricular wall (see the image below). Components of the mitral valve apparatus. The pulmonic valve divides the right ventricular outflow tract from the pulmonary artery. In normal conditions, the pulmonic valve prevents regurgitation of deoxygenated blood from the pulmonary artery back to the right ventricle. It is a semilunar valve with 3 cusps, and it is located anterior, superior, and slightly to the left of the aortic valve. The right atrioventricular valve complex (the tricuspid valve) is made up of the 3 valve leaflets, the annulus, the supporting chordae tendineae, and the papillary muscles. The atrial and ventricular masses, conduction system tissue, and support structure of the fibroelastic cardiac skeleton allow coordinated actions of the tricuspid valve. For more information about the relevant anatomy, see Aortic Valve Anatomy, Mitral Valve Anatomy, Pulmonic Valve Anatomy, and Tricuspid Valve Anatomy. Percutaneous balloon aortic valvuloplasty was developed after the successes achieved with mitral and pulmonary valvuloplasties in the 1980s. This procedure provides only modest hemodynamic improvement and is associated with a high incidence of restenosis. Long-term survival after this procedure is not significantly different from the natural history of aortic stenosis. At present, percutaneous balloon aortic valvuloplasty is done primarily in inoperable patients for the purpose of achieving temporary improvement in quality of life or buying time before more definitive treatment can be performed. The current focus of scientific interest has shifted from balloon aortic valvuloplasty to percutaneous aortic valve replacement. The current design requirements for a permanent catheter-based aortic valve system are formidable and have evolved over the past few years since the first successful percutaneous aortic valve implant by Cribier et al. Design engineers currently favor the use of biologic trileaflet tissue valves, and pericardium has been the valve material of choice. Percutaneous aortic valve replacement is indicated for high-risk patients with a predicted EuroSCORE greater than 30% and an actual 30-day mortality lower than 10%. It is contraindicated in patients with severe calcification of the aortic valve and severe peripheral vascular disease. The stent valve is deployed either by expansion of the balloon on a balloon-expandable stent or by withdrawal of a sheath that releases a self-expanding stent. The deployed stent valve must remain securely implanted with displacement of the diseased native valve so that the new tissue valve can begin to function immediately. The hemodynamic performance of catheter-based aortic valves should be similar to that of their surgical counterparts, with minimal transvalvular gradients (< 10 mm Hg) and measured aortic valve areas of 1.5-2.0 cm2. No component of the stent valve can obstruct the native coronary arteries or interfere with the function of the mitral valve apparatus. In addition, the stent valve must be circumferentially apposed to the aortic annulus to prevent paravalvular aortic regurgitation. Successful application of catheter-based aortic valve technology is highly dependent on careful attention to operator technique and procedural methodology. All current catheter-based aortic stent valve procedures begin with conventional balloon aortic valvuloplasty to provide an enlarged passageway for the insertion of the larger stent-valve device. Careful patient screening for vascular access and accurate assessment of aortic annulus dimensions for correct valve sizing are critical. Delivery can be accomplished either via an antegrade approach, requiring transseptal puncture and negotiation of the mitral valve, or via a retrograde approach from the femoral artery. The transapical approach is a relatively recent development that is applicable only to a very limited patient population in which the retrograde approach fails. The choice of approach depends on operator experience and the individual case, although lately the retrograde approach has become more popular. The antegrade implantation technique originally described by Cribier et al is extremely complex,  involving transseptal puncture; flotation of a balloon-tipped catheter through the left atrium, left ventricle, and aortic valve to the descending aorta; and arterial exteriorization of the intravascular guide wire. Although this approach combines the lower risk of femoral venous access with the ability to cross more heavily calcified valves, it may jeopardize the anterior leaflet of the mitral valve. Because of increased periprocedural complications associated with the transvenous antegrade approach, the transarterial retrograde approach is now preferred. [2, 6] This approach involves femoral artery access (and, usually, surgical arterial repair for closure); negotiation of the femoral, iliac, and aortic vasculature; and retrograde crossing of the calcified aortic valve. In general, the implanted catheter-based aortic valves are oversized relative to the annulus to ensure stability and immobility of the implanted stent and minimize paravalvular regurgitation. Percutaneous aortic valve placement via retrograde approach. The retrograde approach, although less technically demanding than the antegrade approach, may be difficult in patients with heavily diseased descending aortas. Clinical trials have been performed widely in Europe. A phase I trial (REVIVAL) was completed at 3 cohort sites in the United States, [12, 13] finding the results of percutaneous therapy to be comparable to those of conventional therapy. The study included 55 patients with aortic valve area greater than 0.7 cm2, age older than 70 years, EuroSCORE higher than 20, Society of Thoracic Surgeons mortality risk score higher than 10, and New York Heart Association functional class III or IV. A phase II trial (PARTNER) is currently under way. The plan is to include 350 high-risk patients in the first arm and compare traditional aortic valve replacement with percutaneous aortic valve replacement. The second arm should include 250 inoperable patients and compare percutaneous aortic valve replacement with contemporary medical therapy. Unbehaun et al performed transapical aortic valve implantation in 300 high-risk patients. The procedure was successful in 99.7% of patients, with a 30-day mortality rate of 4.7% overall. Cumulative survival was reported to be 83% at 1 year, 76% at 1.5 years, and 65% at 2 years and beyond. Percutaneous mitral valvuloplasty is widely practiced in the United States. It is effective in patients with commissural fusion secondary to rheumatic disease; however, it is not applicable to mitral stenosis secondary to mitral annular calcification. The procedure is typically performed under TEE or ICE with a single Inoue balloon, a double balloon, or a rigid mechanical device. Percutaneous mitral valvuloplasty is performed via an antegrade approach involving transseptal puncture followed by flotation of a balloon-tipped catheter through the left atrium to the mitral valve level. The most distal part of the balloon is placed against the subvalvular apparatus and inflated first to secure the position. This step is followed by inflation of the proximal part of the balloon, which helps anchor the balloon to the mitral position. If the balloon position looks optimal, the middle part is inflated, thus increasing the mitral valve area. For stenotic mitral valves, catheter-based balloon valvuloplasty is now the primary therapeutic option, whereas until relatively recently, regurgitant valves have been amenable only to surgical treatment. Valve repair is increasingly preferred because it is associated with better survival and avoids the need for anticoagulation; moreover, it conserves the papillary muscle architecture and its vital role in overall ventricular function. Myxomatous disease and functional regurgitation, which are the most common mechanisms of mitral valve dysfunction, are also the most amenable to valve repair. Various techniques have now been developed for reducing mitral regurgitation via a catheter-based approach in these circumstances. The following are potential components of percutaneous mitral valve repair. The concept of edge-to-edge repair was developed as a surgical strategy for treating mitral regurgitation caused by anterior leaflet prolapse. 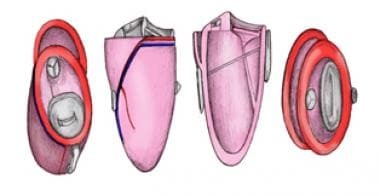 The technique, first described by Alfieri (and consequently referred to as the Alfieri stitch), opposes the central portions of the anterior and posterior mitral valve leaflets to create a double-orifice valve with reduced leaflet excursion and less regurgitation. The edge-to-edge repair, initially performed as a rescue operation, later became more widely used because of its simplicity and encouraging results. Furthermore, its uncomplicated nature encouraged interventionalists to develop an analogous transcatheter-based technique. In the surgical procedure, however, the repair is usually combined with an annuloplasty, which is not currently the case in the corresponding catheter-based procedure. Percutaneous mitral valve repair via transseptal puncture. If the location of the clip is suboptimal, the clip can be reopened and repositioned; only after the final position is confirmed is the delivery system detached. In some cases, deployment of 2 devices has been necessary to achieve adequate reduction of mitral regurgitation. At 6 months, the device is completely incorporated into the tissue bridge, mimicking the result of surgery. The procedure is performed with general anesthesia under the guidance of fluoroscopy and TEE (see the videos below). Transthoracic echocardiogram demonstrating severe mitral regurgitation with heavily calcified mitral valve and prolapse of posterior leaflet into left atrium. The procedure is technically demanding and is likely to be limited to specialist centers with experienced interventionalists and echocardiologists who work closely together. Annuloplasty is a fundamental component of most mitral valve surgery and can sometimes be used alone to treat functional mitral regurgitation. The goal is to rectify annular dilatation while reducing the anteroposterior diameter of the valve to promote better leaflet coaptation and reduce regurgitation. Optimal surgical results are usually achieved with insertion of a prosthetic band or ring, though other techniques using pericardium, Dacron, or sutures alone are described. The central role of annular dilatation in the progression of mitral regurgitation makes it an important target for catheter-based treatments. A catheter is advanced into the coronary sinus via a transjugular access site, and the anchoring device is placed in the distal coronary sinus with a tensioning element (a wire or spring surrounded by absorbable material) that attaches the device to the proximal coronary sinus anchor. This approach is suitable for degenerative prolapse, functional congestive heart failure, and ischemic mitral regurgitation. [5, 7] However, it is limited by the substantial variations in normal coronary sinus anatomy, the varying distance between the coronary sinus and mitral valve annulus, and the possibility of circumflex artery compromise. It also does not address the anterior annulus problems. Detailed imaging, including angiography and venography, form an important aspect of the "decision to proceed" algorithm. Other concerns include late dilatation of the anterior annulus, leaflet tethering due to papillary muscle displacement, and annular calcification. Finally, the long-term consequences of leaving such an implant in the coronary sinus are unknown, though experience obtained with pacing wires is reassuring. A novel off-pump surgical transventricular repair that involves placement of a tensioning cable directly through the left ventricular chamber (Coapsys; Myocor, Inc, Maple Grove, MN) has been developed to address mitral annular and ventricular dimensional corrections associated with mitral repair strategies. In this technique, anchoring pads on either side of the ventricle are used to allow the cable to apply tension across the chamber. This shortens the septal lateral dimension and remodels the left ventricular chamber (see the image below). Surgical approach to mitral valve repair using external pads and transventricular cord. This technique has been adapted to transpericardial percutaneous use in animal models. Tether places tension on septal-lateral dimension of mitral valve and also remodels basal left ventricle with reorientation of papillary muscles. This approach is unique in that it is the only mitral repair that directly remodels the left ventricular chamber, which gives it certain potential advantages in cases of functional mitral regurgitation. A transpericardial percutaneous (subxiphoid) method that can reproduce the effects of the surgical approach (I-Coapsys) is in development in early clinical trials. The encouraging nature of these early results led to the design and implementation of a pivotal phase II trial in which patients are randomized to the Evalve clip or conventional surgery (EVEREST II). To date, more than 185 patients have undergone treatment with this device. Currently the procedure takes about 70-90 minutes. Percutaneous mitral valve replacement has not yet been attempted in humans. Its applicability is limited by several important issues, including the asymmetric shape of the mitral annulus; concerns about cuff design or anchoring and accurate device sizing; mitral annular dilatation, which is frequently observed in patients with mitral regurgitation; and a foreshortened and restrictive subvalvular apparatus in rheumatic mitral stenosis and mitral annular calcification. Nevertheless, a less invasive mitral valve replacement procedure may be a possibility in the future. Potential deployment routes include an antegrade route via a percutaneous transseptal approach, an antegrade route through the left atrium via a minithoracotomy, and a retrograde route through the left ventricular apex via a minithoracotomy. Of the valve replacement procedures, percutaneous pulmonary valve replacement actually represents the largest clinical experience. Acquired pulmonary valve disease in adults is rare, with regurgitation in the setting of pulmonary hypertension being the most frequent cause. In individuals with complex congenital heart disease, however, pulmonary valve dysfunction is common and often the principle reason for late complications. Pulmonary regurgitation commonly occurs following tetralogy of Fallot repair. Thus, for the rapidly growing population of survivors with repaired congenital heart disease, a percutaneous approach to pulmonary valve replacement could avoid the morbidity and discomfort attendant on repeated open-heart surgery. Percutaneous pulmonary valve replacement is indicated for congenital pulmonary stenosis and pulmonary stenosis and regurgitation in a patient with congenital heart disease who has previously undergone right ventricular outflow tract surgery. The main limitation of percutaneous pulmonary valve replacement is the meager selection of device sizes. A much wider selection of sizes must be developed for optimal treatment of young children and patients with dilated right ventricular outflow tracts. Positioning of the devices also remains a challenge but is not as critical as it is for aortic valve procedures; preprocedural imaging may assist in identifying the optimal position for deployment. Percutaneous tricuspid valve devices remain in the preclinical stages of development. Tricuspid annular devices must be correctly positioned to avoid obstruction of the coronary sinus ostium or damage to the atrioventricular node. An advantage of these devices is that they can be deployed under significantly tighter time constraints than other valve devices because right chamber pressures are lower and rapid pacing will not be required. Their disadvantages include the greater fragility of tricuspid valve leaflets, the lack of firm surrounding tissue in the tricuspid annulus, and the frequent annular dilatation in patients with tricuspid regurgitation. Percutaneous tricuspid valves also will not prevent further annular dilation and may therefore be susceptible to future dehiscence or embolization. However, the greatest limitations facing tricuspid valve therapies are not the valve-related factors but, rather, the disease-related factors in this population, including right ventricular failure and advanced pulmonary hypertension. Sharma S, Mehra A, Rahimtoola SH. Valvular heart disease: a century of progress. Am J Med. 2008 Aug. 121(8):664-73. [Medline]. Cribier A, Eltchaninoff H, Bash A, Borenstein N, Tron C, Bauer F. Percutaneous transcatheter implantation of an aortic valve prosthesis for calcific aortic stenosis: first human case description. Circulation. 2002 Dec 10. 106(24):3006-8. [Medline]. Harris BS, De Cecco CN, Schoepf UJ, et al. Dual-Source CT Imaging to Plan Transcatheter Aortic Valve Replacement: Accuracy for Diagnosis of Obstructive Coronary Artery Disease. Radiology. 2014 Nov 12. 140763. [Medline]. Rosengart TK, Feldman T, Borger MA, Vassiliades TA Jr, Gillinov AM, Hoercher KJ. Percutaneous and minimally invasive valve procedures: a scientific statement from the American Heart Association Council on Cardiovascular Surgery and Anesthesia, Council on Clinical Cardiology, Functional Genomics and Translational Biology Interdisciplinary Working Group, and Quality of Care and Outcomes Research Interdisciplinary Working Group. Circulation. 2008 Apr 1. 117(13):1750-67. [Medline]. Feldman T, Leon MB. Prospects for percutaneous valve therapies. Circulation. 2007 Dec 11. 116(24):2866-77. [Medline]. Webb JG, Chandavimol M, Thompson CR, Ricci DR, Carere RG, Munt BI, et al. Percutaneous aortic valve implantation retrograde from the femoral artery. Circulation. 2006 Feb 14. 113(6):842-50. [Medline]. Coats L, Bonhoeffer P. New percutaneous treatments for valve disease. Heart. 2007 May. 93(5):639-44. [Medline]. Munt B, Webb J. Percutaneous valve repair and replacement techniques. Heart. 2006 Oct. 92(10):1369-72. [Medline]. Walther T, Dewey T, Wimmer-Greinecker G, Doss M, Hambrecht R, Schuler G, et al. Transapical approach for sutureless stent-fixed aortic valve implantation: experimental results. Eur J Cardiothorac Surg. 2006 May. 29(5):703-8. [Medline]. Lichtenstein SV, Cheung A, Ye J, Thompson CR, Carere RG, Pasupati S. Transapical transcatheter aortic valve implantation in humans: initial clinical experience. Circulation. 2006 Aug 8. 114(6):591-6. [Medline]. Huber CH, Cohn LH, von Segesser LK. Direct-access valve replacement a novel approach for off-pump valve implantation using valved stents. J Am Coll Cardiol. 2005 Jul 19. 46(2):366-70. [Medline]. Kodali SK, O'Neill W, Moses JW, Kapadia S, Williams M, Hanzel G, et al. Preliminary Results from the PeRcutaneous EndoVascular Implantation of VALves Trial in High Risk Patients with Critical Aortic Stenosis. Am J Cardiol. 2006. 98(Suppl1):48M. Kodali SK, O'Neill WW, Moses JW, Williams M, Smith CR, Tuzcu M, et al. Early and late (one year) outcomes following transcatheter aortic valve implantation in patients with severe aortic stenosis (from the United States REVIVAL trial). Am J Cardiol. 2011 Apr 1. 107(7):1058-64. [Medline]. Stortecky S, Brinks H, Wenaweser P, Huber C, Pilgrim T, Windecker S, et al. Transcatheter aortic valve implantation or surgical aortic valve replacement as redo procedure after prior coronary artery bypass grafting. Ann Thorac Surg. 2011 Oct. 92(4):1324-31. [Medline]. Unbehaun A, Pasic M, Drews T, Dreysse S, Kukucka M, Hetzer R, et al. Analysis of Survival in 300 High-Risk Patients up to 2.5 Years After Transapical Aortic Valve Implantation. Ann Thorac Surg. 2011 Oct. 92(4):1315-23. [Medline]. Vassiliades TA Jr, Block PC, Cohn LH, Adams DH, Borer JS, Feldman T. The clinical development of percutaneous heart valve technology: a position statement of the Society of Thoracic Surgeons (STS), the American Association for Thoracic Surgery (AATS), and the Society for Cardiovascular Angiography and Interventions (SCAI) Endorsed by the American College of Cardiology Foundation (ACCF) and the American Heart Association (AHA). J Am Coll Cardiol. 2005 May 3. 45(9):1554-60. [Medline]. Webb JG, Harnek J, Munt BI, Kimblad PO, Chandavimol M, Thompson CR, et al. Percutaneous transvenous mitral annuloplasty: initial human experience with device implantation in the coronary sinus. Circulation. 2006 Feb 14. 113(6):851-5. [Medline]. Feldman T, Wasserman HS, Herrmann HC, Gray W, Block PC, Whitlow P, et al. Percutaneous mitral valve repair using the edge-to-edge technique: six-month results of the EVEREST Phase I Clinical Trial. J Am Coll Cardiol. 2005 Dec 6. 46(11):2134-40. [Medline]. Feldman T, Wasserman HS, Herrmann HC, Whitlow PL, Block PC, Gray WA, et al. Edge-to-edge mitral valve repair using the Evalve MitraClip: One year results of the EVEREST phase I clinical trial. Am J Cardiol. 2005. 96(Suppl):49H. Feldman T, Foster E, Glower DD, Kar S, Rinaldi MJ, Fail PS, et al. 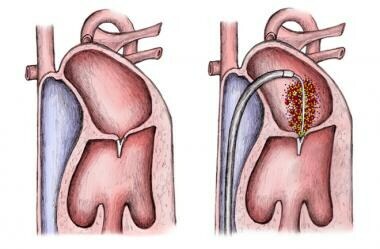 Percutaneous repair or surgery for mitral regurgitation. N Engl J Med. 2011 Apr 14. 364(15):1395-406. [Medline]. Grossi EA, Patel N, Woo YJ, Goldberg JD, Schwartz CF, Subramanian V, et al. Outcomes of the RESTOR-MV Trial (Randomized Evaluation of a Surgical Treatment for Off-Pump Repair of the Mitral Valve). J Am Coll Cardiol. 2010 Dec 7. 56(24):1984-93. [Medline]. Lutter G, Ardehali R, Cremer J, Bonhoeffer P. Percutaneous valve replacement: current state and future prospects. Ann Thorac Surg. 2004 Dec. 78(6):2199-206. [Medline].